The genus Laelia. 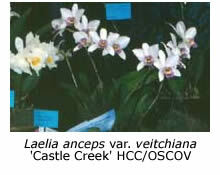 There are about 75 species in the genus Laelia. Most epiphytic species of Laelia grow in Mexico while the rupiculous laelias (those that grow on rocks) grow in Brazil. The Mexican species, Laelia anceps and Laelia gouldiana, are arguably the easiest to grow under cool conditions, especially if you have a shadehouse with a fibreglass roof, so that the plants can be kept fairly dry in winter. Laelia anceps has been cultivated in Europe for over 150 years. Over twenty different varieties were then cultivated but only a few are common in Melbourne today. Laelia anceps in Nature. In its native habitat Laelia anceps grows on tree trunks or branches on the edge of forests at altitudes of 1500-2000 m. The plants are often exposed to full sun and strong winds, with hot days and cold nights. Summer (the main growing season) is very wet and the plants receive heavy rain each evening and remain wet overnight. The next morning strong winds and sunshine quickly dry the plants before rain falls again in the evening. By contrast, the weather is cool and dry in winter and the plants receive little water until misty rain arrives in spring. New growths begin at this time with the new flower spike emerging from the centre of the new growth during summer. The flowers open as the new growth matures in late autumn. 1. grow L. anceps on a mount (e.g. tree-fern slab or a rough, long-lasting branch of oak or Casuarina, in my experience, cork mounts do not suit L. anceps). 2. hang the plant where it receives good air movement and good light (30-50% shade in summer, less or none in winter). 3. water heavily in summer and early autumn, preferably in the evening, applying liquid fertiliser occasionally. 4. after the plant has flowered (usually in late autumn), water only occasionally until spring. 5. then mist the plant daily until new growth appears. At this stage begin the cycle again with heavy watering each evening. Laelia anceps can also be grown in a pot, using coarse bark as the potting medium. Because each year’s new growth is separated from the previous year’s growth by about 50 mm on the ascending rhizome, the plant soon climbs out of its pot and the new roots hang over the edge. Although the plant grows happily like this, it soon becomes top-heavy and will then probably need to be broken up and repotted. The flowers are usually rose, pink, violet or white in colour, with a darker labellum carrying a central yellow spot. The tall stem usually carries two to six flowers. Chamberlain’s variety has larger, more deeply coloured flowers than most. Laelia gouldiana occurs in the same habitat as L. anceps and it can also be grown and flowered in an unheated shadehouse. It usually carries more flowers of deeper colour than L. anceps but they are slightly smaller (about 75 mm across). Some botanists once believed that L. gouldiana is not a true species but a natural hybrid between L. anceps and L. autumnalis. All three grow together in the same mountainous regions of Mexico. However most authorities today regard L. gouldiana as a species and it should therefore be benched in the class Any Other Species or Species Any Genus. Both Laelia anceps and L. gouldiana grow readily from leafless pseudo-bulbs in the same manner as cymbidiums do from their backbulbs. They ‘strike’ better if left in pairs. Many plants grown in Melbourne are probably divisions of older plants. Small divisions occasionally appear on the sales bench at meetings and shows. 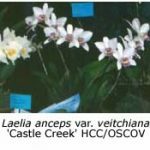 Small plants raised from seed can sometimes be found in orchid nurseries – these may produce flowers of higher quality, if they have been bred from selected parent plants.